Today, we continue our ongoing series on Ai Weiwei’s book, Time and place. By 2006 China had already tapped Zhang Yimou to direct the opening ceremony of the Beijing Olympics. To Ai this was completely unacceptable, and he decided to devote a rather fiery post to the injustice of this decision. It was shortly before this that the once daring director had begun to back away from the line. As a friend who had attended film school with Zhang told me, it seemed to her that the gov’t had finally “gotten” him. But Ai’s essay is still relevant today, especially as we sit through two more weeks of Olympics. He says, “Every competition has a winner, and the victorious side always uses its success to prove a fact.” This should be kept in mind when debating whether or not America’s “free-market” system of athletic training vs. the Chinese state-backed approach is more successful. It isn’t really something we’re going to learn from a few games of basketball or 110 meters of hurdles (interestingly, if one combines the total number of medals won this year by China and Russia and compare them to the number won by the U.S. and G.B. you find they come out exactly even). Ai goes deeper into the nature of competitions in the Chinese context and argues that, “A world with no true goodness and no beauty is necessarily this way. In all competitions here, there are only painstakingly arranged victors, losers, and observers. The weak triumph and the superior suffer defeat, and losers defeat those who should be victors. This is already common knowledge, for the theory of evolution does not apply here.” This seems to get more to the heart of the value of competition within a market system vs. the current system in China that tends to give advantages to State companies. This point has been mentioned time and again by a friend whose private company once boomed only to be squeezed out of the market by “losers” who had been handed victory. In this blog post Ai Weiwei recounts his participation in a forum that was discussing Chinese culture in crisis. I’m not sure if he even made it to the event before he decided it would be a waste of time, but being who he is, he decided at the very least he could “contribute” to the conversation. This seems to have taken the form of swearing at one of the presenters who seemed bent on devaluing low-culture like Internet writing. The presenter, who began by bashing Yu Hua so violently that Ai believed for a moment that Yu Hua must be some kind of inanimate object, proceeded then to attack Han Han as a fleeting personality. It was at that point Ai called BS. In a somewhat telling line Ai says, “I don’t understand why “egocentric” people can’t become masters. Does that even really matter? Isn’t everyone self indulgent?” I’ve always wondered whether Ai’s various forms of art were self-less jabs at authority or if they were the attention seeking behavior that the Global Times claims they are. Perhaps it doesn’t matter what Ai’s motivations are as much as what kind of affect his art has on those who see it. This week at a presentation a man asked me why Ai Weiwei was the only dissident that most Americans were aware of. I replied by saying that Ai was simply one of the most fun to watch. So now I’m pondering if Ai’s actions can be called “egocentric” if the result is a global awareness of the ongoing struggle to create a China ruled by law. In this short essay Ai compares the devastation of the Tangshan Earthquake to the destructive force of the Cultural Revolution. As he says, “There are two types of disasters: visible and quantifiable natural disasters, and invisible, immeasurable psychological disasters.” He also reminds his readers that the Tangshan earthquake and the death of several Chinese leaders imbued the event with mystical interpretations. This coincidence has been mentioned time and again this year as China ramps up for leadership change. I think Ai is absolutely right to say there are still “aftershocks” of the Cultural Revolution. One of my Chinese friends says he still shouts criticisms in his sleep, sitting upright in bed and pointing at imaginary class enemies. It also seems to have fueled the current generation of activists and dissidents. What else can possibly come of having your childhood shaped by violence and revolt? The Shengs were a prominent family in Ningpo. There were the old Shengs and the new Shengs; Mr. Sheng’s family was the old Shengs, landowners for generations. 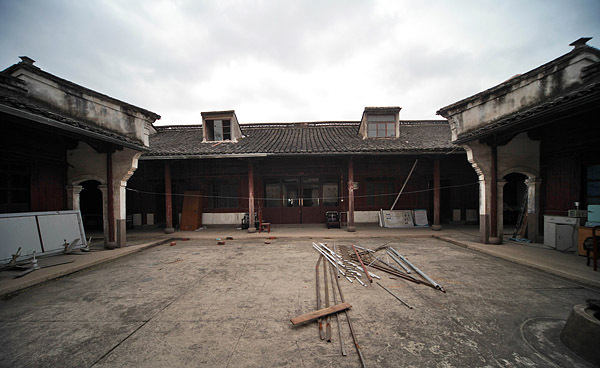 The family residence consisted of ten adjoining quadrangles, the innermost being the ancestor hall where memorial tablets and portraits of ancestors were displayed. I loved to play there the best, said Mr. Sheng, on my family’s visits when I was a little boy, because it was as big as a basketball court and I could run amok there, whereas my older sisters were scared and wouldn’t dare to go. Mr. Sheng’s mother was also from Ningpo, the daughter of a brewery owner. Mr. Sheng’s eldest sister and Sheng Shuren, his only older brother, were both born in Ningpo. An old house in Ningbo. In the early 1920s when Shanghai was experiencing an unprecedented industrial boom, their father moved his family there. For some years, he was the sales executive of the legendary Tian Chu MSG manufacturer, travelling frequently in Southeast Asian countries and all the way to San Francisco across the Pacific. He did very well and the Shengs lives comfortably in their house inside the French settlement, where Mr. Sheng’s older sisters and brother grew up and Mr. Sheng himself was born. In the mid 1930s, Mr. Sheng’s father founded a kerosene refinery and owned a barge that transported goods between the plant and the Wusong Mouth where the Huangpo River meets the Yangtzi. Just as the father’s career was peaking, the Japanese bombed the plant, destroying everything, and took away the barge. Mr. Sheng’s father was instantly bankrupted, had to sell the house, and the family lived on savings. After the Japanese surrendered, the Nationalist government took over the barge. Mr. Sheng’s father used whatever connections he could and paid “activity fees” to a lot of people hoping to retrieve the only property he had left. The bribes added up but did not bring back his barge. By the time the communists took over Shanghai, there was no trace of the boat anymore. In Ningpo, over the years, Mr. Sheng’s grandmother had accumulated more land using the money her son had been sending her, and when the communist land reform took place, her land and the family home were seized and distributed to the poor. In the 1950s, Mr. Sheng’s father worked in Hong Kong for a few years and returned to Shanghai at the end of the decade because of declining health. In February 1961, Mr. Sheng, already teaching at Anhui University, saw his older brother when he visited home for the Chinese New Year. He looked pretty well, said Mr. Sheng. Did he? I was surprised to hear that. But on second thought it made perfect sense: After a year and half in the forced labor camp, he could only be glad to return home and in the company of the family. True that he had just suffered the most egregious injustice, but the full meaning of it could take some time to manifest itself, and, in any case, it is not hard for a capable man in his prime, like himself, to keep hope alive. After the Chinese New Year, Sheng Shuren returned to Beijing—as was required of him—to “take care of the paperwork.” That included cancelling his resident registration from municipal Beijing and signing the “Conclusions” about his case in the Organization Department of the Xinhua News Agency that stated “Sheng Shuren has admitted to the aforementioned wrongdoing without reservations” and announced his expulsion from the Agency. It didn’t matter that he had never admitted to the charges against him, nor had anyone asked for, or allowed him to express, his opinions about his own case. He signed the paper, prepared beforehand and dated, placed in front of him as he was supposed to. On his way back to Shanghai, he stopped in Hefei to see what Anhui University was like. His younger brother was trying to find him a teaching job at the university. In bad need of talent, the university responded eagerly. But many days passed without a follow-up, and when Mr. Sheng inquired, he was simply told no without an explanation. Back in Shanghai, Sheng Shuren found he was denied a Shanghai resident registration by the Municipal Public Security Bureau. He became what the Shanghaiese called a “pocket registration,” or a shadow resident. Luckily for him, he was issued a Food Ration Certificate, except that the ration for a regular adult was 14 kilos a month but for him it was 12.5 kilos. Soon after he returned, his wife divorce him, each having the custody of two children, although, Mr. Sheng said, his wife still helped take care of the other two children and she also gave all the jewelry the Shengs had given her years ago for her wedding back to her husband to help him out. My brother’s subsequent attempts to find a job had all come to nothing, said Mr. Sheng, and he began to teach English stealthily—if caught, he would be in more trouble—to scrape a few yuan here and a few yuan there. His eldest daughter was a brilliant student, did very well on her national college entrance exams, but was denied a college admission because of her father. She came to me, said Mr. Sheng, asking what she should do; I coached her to make a high-minded gesture in school by saying “I love the Party with all my heart and I am prepared to go anywhere the Party assigns me.” My hope was, said Mr. Sheng, that, by looking righteous, perhaps she would arouse someone’s sympathy. But nobody took pity on her. Later on, Mr. Sheng found a job for her in Yunnan, the southwestern province, through his connections. 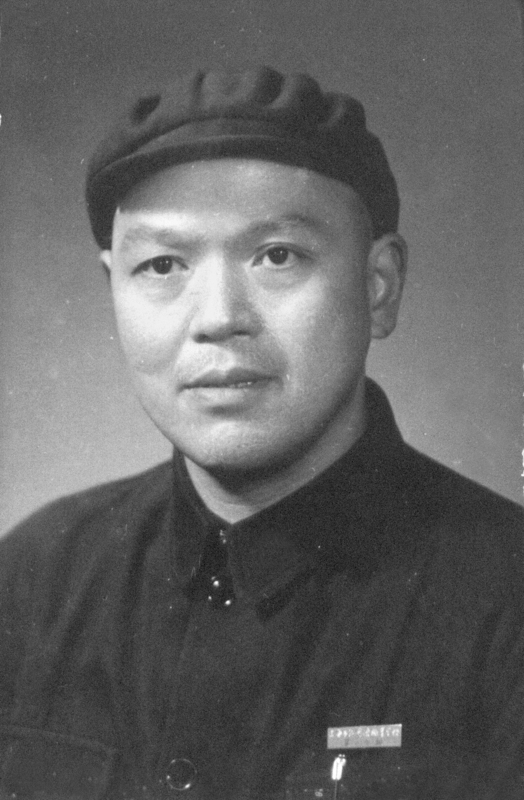 Sheng Shuren, around 1965, wearing a pin of the foreign language school where he was teaching, a hopeful time for him. In mid-1960s, Shanghai Foreign Language College established a training program for studying-aboard candidates, and, with the help from his friend Qian Weifan, Sheng Shuren taught English there. The hope was, if he continued to teach and make himself essential, perhaps the college would offer him a permanent job down the road. But before long, the Cultural Revolution came, the training program was scrapped. During the Cultural Revolution, Sheng Shuren was largely spared the fresh assault on the educated class that reached a new, vicious peak, thanks to the fact that he had already been ostracized from society, without registration, jobless, and reporting to no particular work unit. One summer though when I was on vacation at home, said Mr. Sheng, my brother disappeared all of a sudden one day. His eldest son and I looked for him for three or four days and couldn’t find him. Finally, we found him in a little hostel occupied by a faction of Shanghai’s “revolutionary rebels” who had detained him at the black market and kept him for twenty or thirty days before letting him go. An old woman with bound feet told on him, he later told me. In Shanghai at the time, said Mr. Sheng, everybody knew the black market and used it, but only people like him, if not cautious, would be picked on. That was how he spent those years, said Mr. Sheng, earning a few yuan stealthily teaching English, getting some help from his two older children after they had grown and had jobs, and, now and then, my mother would tuck a few yuan into his hand. It was a hard time for the rest of us too, said Mr. Sheng, my monthly salary was fifty yuan, my sisters struggled too, all of us had to support our parents, and we had not been able to help him. When he was hit by a car and died, said Mr. Sheng, on his way to or from a hospital visit, no one in my family was in Shanghai. The neighborhood committee sold his furniture—the furniture my parents had left behind—on the spot to whoever took it and for whatever offer and paid for his hospital bills and his cremation before one of his sons made it back to Shanghai. Have you read Rabindranath Tagore? Mr. Sheng asked me. I said I know the name, I might have read a few pages of Stray Birds in college, but I have forgotten it all. My brother became the untouchable, said Mr. Sheng, when he came back from Beijing. Do you see? Uncle Erning, of course, was raging about not just Sheng Shuren’s case, but also his own. I thought about the word “shameful”. Shame, it seems, has its own life regardless of its cause and whether there is justice to it. It lived with him like a shadow and lives on long after he was gone. Even Erjia would unconsciously use a word like that. Last week I carefully broached the subject of Tian’anmen Square with one of my co-workers. Together we looked through a series of pictures from that day from The Atlantic (excellent), which sparked a very interesting, and yet minimally productive conversation. It was her first time seeing evidence of civilian casualties, and I explained that no one was certain how many students and workers had died in the Square, but most foreign sources say hundreds. With the ongoing violence in Syria (which she is following), this wasn’t an easy idea to accept. So I told her that I had never really heard about June 4th from a Chinese view, and asked her to tell me what it had been like. She said here in Nanjing and in Beijing many workers and students gathered to protest against the gov’t. Some of them might have been working with foreign gov’ts and that many others had joined in. On the third, the students had attacked the military. She emphasized that just like with Syria it was sad anytime civilians were killed by their gov’t. Even though this co-worker is critical of most of what the Party says, and was willing to accept that the number of students was probably higher than what had been reported in China, she couldn’t shake this fear of chaos. This fear of chaos is pervasive, and is reproduced over and over again in China’s media. Discussion of the Arab Spring had very little to do with the power of the people, or their desire to shape their own countries; instead it focused on what the GDP losses must have been for Egypt with all those people milling about in Tahir Square, the soaring prices of tomatoes, and the unnecessary casualties. If one took People’s Daily and Global Times seriously, they would assume that most of the world remains plunged in chaos with no end in site. In fact the word “chaos” appears on at least a weekly if not daily basis in both papers. A major hurdle for Chinese democracy activists will be convincing their fellow countrymen that change doesn’t have to be chaotic. Unfortunately, most Chinese people have very vivid memories of chaos, while democracy is an intangible idea that has never been seen by the majority of people. In this way, the tragedies of the Great Leap Forward and the Cultural Revolution have helped to cement the Party’s power. For political reform to be a palatable option, activists will have to demonstrate on some scale that reform and revolution are very different things. Only by convincing farmers and factory workers that democracy is a way to a greater form of stability, one that doesn’t require Chengguan or Weibo censors and could protect their property and wages, will they succeed. I received this as an email today and was asked to share it with you all. All of the things happening with the drama of Chen and Bo haven’t even phased people here as they are still more concerned with surviving in their daily lives. But then today that changed. My boyfriend (a Chinese professor of English) received a strange text message. He sent it to me and was very concerned because we are planning on getting married and moving to the US as soon as possible. The text was in Chinese and my Chinese was too poor to understand all of it so he translated it. It read: an announcement received today from concerned authorities that all leaders and professors are to turn in all personal passports and visas immediately to be kept and maintained by the concerned authorities. This to me sounds like: we want to control who tries to leave here because we are having too many people try to get away from China which is causing an embarrassment to the gov’t. Maybe it is nothing, but it is too much of a coincidence with what is going on in Beijing. What can I do? Luckily he doesn’t have a passport or visa yet so he doesn’t have to hand it over but what do I do? I don’t want to leave him behind if things get ugly. I am even more concerned given that his family suffered at the hands of the CCP during the Cultural Revolution in such a way that it still gives them nightmares. Sorry as I am typing quickly before I lose my connection. Yes by all means. I have quietly stood by for too long. I have been afraid for all of my friends’ safety. Now, I am scared and not sure how else to help. I want to help not hurt anyone. And I have long been a lover of China culture and language, however never the government. But I keep my mouth shut to keep them safe, but in our private life it is all my boyfriend and I talk about, he always tells me he loves China but is afraid another Cultural Revolution will happen before his son grows up. He grew up at the end of it and the fear in his eyes and voice is palpable. He is concerned that no matter whose side you choose the social instability will destroy all that so many people have worked so hard for in their lives. He lived during times where his older siblings didn’t eat so he, the youngest, could. He doesn’t want to revisit that time, ever. Is something similar happening where you are? Yesterday Yaxue posted a piece entitled “An Angry Father,” in which she asked the question – How can a parent protect their child from the poison of the Party’s propaganda? Yaxue also mentioned the feeling of guilt and anger that she experienced as she told a friend not to interfere with the system for the sake of his child. These two ideas I think deserve closer examination. This last week as I visited rural villages in central China, I was struck by the pervasive nature of propaganda. In the countryside slogans were either neatly stenciled on the sides of buildings, or simply scrawled with a paintbrush in the poorest areas. The campaigns seemed relatively harmless, encouraging parents to accept boys and girls as equals, and informing them of the value of education. In the cities bright red banners and bus stop billboards though told me to “Learn from Lei Feng” and develop a harmonious society. At times it reminded me of the pictures I had seen from the Cultural Revolution when China was ruled by hollow mottoes, and made me question if it still is. Then I stepped into the churches that eek out a space in China’s crowded urban areas, each greeted me with the slogan “爱国爱教” (aiguo aijiao – Love the Country, Love Religion), with religion always second to the state. Even in China today, State propaganda is pervasive, intruding in every aspect of life. From the number of children you have to where their loyalties should lay. But propaganda does not silence opposition, it aims simply to yell the loudest and drown out competing voices. To Yaxue’s friend though I say, let them shout. Consider the fact that even with the resources of the State, an untold number of Party backed supporters, and complete control of the media, they are still unable to counter the rumors that people spread in their spare time out of a desire for freedom or maybe just entertainment. Even with Party offices in every school, every public institution, and even in some hotels the Party cannot convince netizens that the system is really as transparent and democratic as they claim. As we are seeing with outspoken dissidents like Yu Jie, Ai Weiwei, Murong Xuecun and dozens of other authors and artists, being poisoned by propaganda does not guarantee death, in some cases after long term exposure it makes one more capable of stomaching its ill effects in ever larger doses. Yaxue regretted writing her friend to tell him, “Please don’t get into an argument, I’m so afraid that they will mistreat your child in school as a result.” I know this feeling as well; I wrote Yaxue months ago asking whether or not she still had family in China to consider after publishing one of her posts. I still feel ashamed of that message, but it felt like something that needed to be said (As you can see though, it didn’t cause her to back down and I’m thankful for that). I would guess that many of those active in human rights in China have experienced this same sickening feeling that comes from cautioning friends before they cross too far over the line. From one view point though, Yaxue’s advice was probably the best advice. If her friend W. had complained to the higher authorities, at worst it would have resulted in some very negative effects for his child, and in the best case would have come to an interesting conversation. In all likelihood, these school programs are probably scheduled by those even higher up than W. can reach. However, W. did not simply remain silent on the issue. He confronted a teacher and then reached out to Yaxue, who in turn reached out to us, and created a conversation on a problem that requires further reflection. Yaxue’s mother warned her “Beware of people—you never know what a complicated web exists among people and what trap you might step into,” but at the same time we never know who might secretly agree with us unless we occasionally bring up uncomfortable conversations with friends as well as strangers. “Shh!” the minister said, “You’ll get him in trouble.” The man however said he didn’t care if anyone else heard him. “Things aren’t so safe now for Christians,” the minister urged, “you should be careful.” To which the man replied “I don’t care who knows Mr. Wang is a Christian because I am Mr. Wang.” The minister was simply looking for a fellow Christian to converse with, but that day started something bigger. Shortly after that exchange Mr. Wang quit his job and discarded his Party membership to start a church. After 7 years of hard work he had attracted fewer than 10 members. Today though, his congregation has nearly 1,500 members. It is the result of both a single conversation and thousands of other conversations that followed with strangers. Our quiet conversations may prove to have results beyond our expectations. Today the pro-Mao (and by extension pro-Bo Xilai) site Utopia announced it would be closed for a month. At the risk of over simplification, this would be like Mitt Romney shutting down Tea Party websites. While one of my co-workers seemed to think that this was “good news,” it’s not the victory for reformers that some might be tempted to claim it is. Too often observers make the mistake of assuming that China is either heading to the left (which in China is the pro-Mao camp) or to the right (reformers), but things are rarely that simple. As other observers have noted, if a site on the right had ventured as far from the permissible realm as Utopia had gone to the left, people would already have been arrested. The message on the site mentioned charges that have resulted in 10+ year sentences for activists on the right, including violating the constitution and attacking state leaders. The right has certainly taken a blow with the ousting of Bo Xilai, but the militarism and nationalism remains. People’s Daily ran two articles about martyrs of the Communist Revolution over the Qingming holiday, a subject that is actually rarely discussed in the paper (1 and 2). It seems far too soon say that pro-Mao ideology has fallen completely out of favor. Moreover, the closure of Utopia is in no way a victory for those opposed to the policies of Bo Xilai and the red ideology he professed belief in, instead it fits neatly within the tactics of the Maoist left (a textbook example of irony). I would argue that this is not a shift toward reform, nor is it a step back to the days of the Cultural Revolution, instead it shows China continuing in a third direction – the one that speaks of reform while crushing opposition. The direction that upholds the Party as an infallible and indispensable institution. The kind of power that seeks to contain conversations and ideas within a narrow scope that can be efficiently monitored, where the policies of the past can neither be praised nor condemned. Those on the right (reform minded) know that the little space that had existed to discuss politics, which was abused in the past few weeks, is an incredibly precious commodity that may disappear all together in the wake of the rumors. The flurry of articles published in Party-backed newspapers condemning such discussions as dangerous should be of great concern to those on both sides. As my co-worker said with a laugh, “They say one month now, but maybe it’s closed forever.” While there is no way of knowing at the moment whether or not she’s right, the gov’t has preferred to soften bad news with limited time frames in the past to avoid negative reactions. In light of the recent restrictions placed on micro-blogging sites, it seems that we are now experiencing the backlash for spreading rumors, and the gov’t is signaling that unless netizens restrict themselves, more limits will be placed on them. It will be interesting to watch and see what happens next – will the netizens retreat as the Party hopes or will they regroup? Considering the continuing discussions on Weibo, even after the arrest of several users, I’d bet on the latter.